To arrive in Chicago in time for a 1 p.m. meeting on Tuesday, planning your trip is simple. Check your preferred airline’s website and book the flight that best suits your travel needs. Some may first visit a site like Kayak.com to cross-check multiple sites for the lowest price. Or, use Orbitz.com where you can not only compare price and times but you can also book directly on the site. The same concept — a site with a powerful search and filter interface, openly available online, and simple enough for anyone to use — should apply when looking to schedule a healthcare appointment. Despite the emergence of on-demand services like AirBnB, Uber, and Expedia, there are many reasons why healthcare has not kept pace with the tech advancements of other industries. A lack of incentive is often to blame, but the shift to value-based care and consumer demand is starting to change that. As a result, the complexities unique to healthcare are not sufficient reasons to stall this type of functionality any longer. To translate this kind of experience for healthcare, the industry needs tools that guide the patient and protect the provider by qualifying appointment types. This empowers patients to take charge of their own care and ultimately impacts patient engagement, attendance rates, and overall health for the better. The ability to match a patient to the best provider in a simple-to-use, cloud-based interface is sometimes referred to as guided search, intelligent scheduling, or decision support. Whatever the terminology, the goal is the same: to simplify the patient booking process while serving individual provider needs. Automating decision making criteria ensures best practices are maintained, regardless if the appointment is booked online or in person. To digitize a provider’s scheduling rules, the result must codify the referral coordinator’s workflow, support different scheduling scenarios, and incorporate appointment specific pre-registration information. Centralized, Open Access: To become an integral solution in helping healthcare providers deliver intelligent access, decision support must be openly accessible. A private portal is a major roadblock against mass adoption. A centralized point of entry for booking allows all patients to start in the same spot, even if some appointment types require a phone consultation. Full Physician Control: Enabling doctors to build and manage their own scheduling rules assures organizations that online scheduling can prevent unwanted appointment scenarios from occurring. A rules library can be created by specialty or appointment type so providers can maintain best practices across bookings. Clinicians and business leaders need to be able to collaborate and coordinate care with a visual tool in minutes. Patient Tracking: Data and analytics can provide key insights into the booking process. For example, analyzing the data can identify referral patterns and opportunities to improve the timeliness, cost and quality of care. In addition, analytics provide perspectives on consumer behavior to help modify processes and rules to improve results. A Human Interface: A robust decision support system has the ability to translate complex scheduling rules into a patient friendly interface. With questions such as, “Where do you hurt?” versus, “What specialty are you looking for?,” patients are led in a guided search towards the care they need. If smart tech is going to improve the consumer experience in healthcare, the relationship between patient and provider needs to start at the very beginning, on the patient’s terms. It’s critical that the digital experience matches demand to capacity while also making it easy for patients to compare and confirm the care they need — at their convenience. An Accenture report estimates that, by the end of 2019, 66 percent of U.S. health systems will offer digital self-scheduling and 64 percent of patients will book their care online. As popularity grows and more patients leverage the benefits of digital access, providers must become confident that patients will be matched with the right provider and availability. If nearly 38 percent of all appointments are anticipated to be booked digitally by 2019, intelligent scheduling will be the mechanism to guide patients and schedulers in a way that ensures an automatic match to the right provider. At that point, decision support technology will be established as the centerpiece of patient engagement and a key differentiator among competitors. 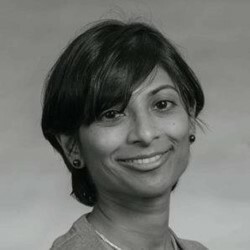 Sanju Pratap is a Sr. Director at MyHealthDirect, a leader in consumer healthcare access solutions. She is an experienced product executive with extensive background in product research, strategy and new product development. Previous to MyHealthDirect, she held several product positions at Emdeon, now Change Healthcare, focused on payer & provider solutions across the revenue cycle. She holds a Bachelors in Civil & Environmental Engineering and an MBA from Georgia Tech.